Holiday house Klarin is just 110 meters away from the beach with breathtaking sea view - situated on the island of Ugljan. Surruonded by crystal clear sea, and untouched nature - island of Ugljan is a true oasis of beautiful landscapes which defines this place as one of most desirable resorts on Mediterranean. The property consists of three apartments, which are connected by an internal staircase. Each apartment has a kitchen with living room, bedroom with double bed and bathroom with shower. On the top floor there is another bedroom with two single beds. The living room has a sofa that can be used for two people. 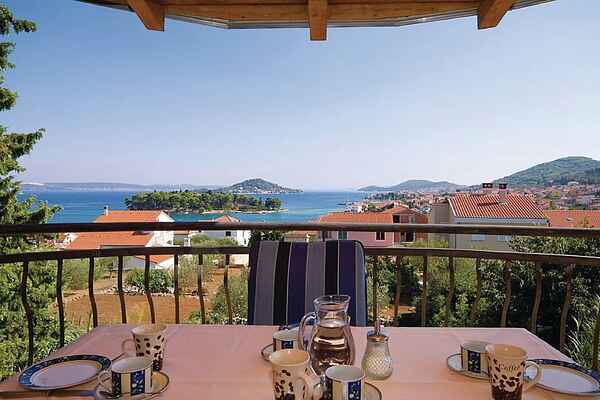 There's a magnificent view from the terrace on the nearby islands and on the city of Zadar. A true Mediterranean atmosphere can be experienced right here on Ugljan -where healthy sea food and traditional Mediterranean cuisine are a part of everday life of local people. Numerous beautiful beaches suitable for children makes this locality a real magnet for family holidays. There are also 4 car parking spaces in front of the house.